The U.S. federal law requires “U.S. persons” as that technical term is defined through complex Title 31 regulations, to provide and report extensive financial account information about the U.S. person. The report is referred to as the “FBAR” – foreign bank account report. An explanation of how it works is set out here, in an earlier post, *Nuances of FBAR – Foreign Bank Account Report Filings – for USCs and LPRs living outside the U.S. The FBAR information includes not only the taxpayer name and bank, but also the account number and the highest account balance. Plus, failing to comply with the law of the FBAR can have devastating affects to individuals, as was the case to Mr. Zwerner. See, Why the Zwerner FBAR Case is Probably a Pyrrhic Victory for the Government – for USCs and LPRs Living Outside the U.S. (Part II). The combination of (1) extensive financial information required under the law to be provided, and (2) aggressive enforcement by the government with potentially financially devastating penalties to the individuals, has provided a toxic mix for criminals who are alarming individuals in thinking they will be prosecuted by he U.S. federal government unless the financial information is provided immediately. The information provided is a “crook’s dream”! Imagine if organized crime groups can access the information of an individual’s account, account number (possibly with multiple banks and multiple accounts throughout the world), their address, their identifying numbers, etc. It must now be filed electronically on Form 114, Report of Foreign Bank and Financial Accounts through the BSA E-Filing System website. 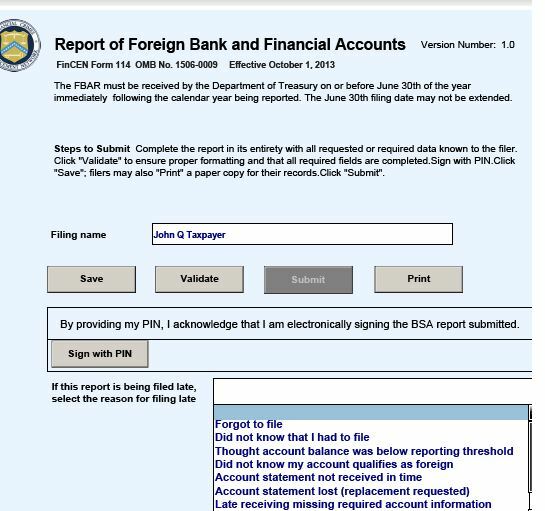 The electronic form supersedes TD F 90-22.1 (the FBAR form that was used in prior years). This treasure trove of information in the wrong hands, can wreak havoc on individuals and their personal finances. Plus, there is not a legal remedy against the U.S. federal for an individual who has their financial information stolen under the guise of tax and bank finance legal compliance. A follow-up post will show examples of recent scams received around the world., which appear very legitimate on their face. I have recently been asked by multiple persons residing overseas if the FBAR request for information is legitimate. Details to follow in a follow-on post. Individuals need to be cautious in many ways when handling their financial and tax affairs. For instance, see, Take Caution when Completing a “Tax Organizer” Provided by Your Tax Return Preparer. Will Qtr 2 Exceed Qtr 1 – 2014, Record of USC Renunciations?